Ahsee Tuala says he feels ‘blessed’ to have been given an opportunity at Saints. The Samoan full-back has been offered a new deal at the club after impressing since arriving in early February. Tuala, who was only playing semi-professional rugby back at home in New Zealand, came in as injury dispensation for Ben Foden. 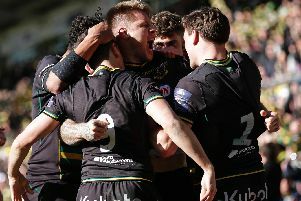 And such has been his impact - he has scored four times in eight appearances, starting the past two matches - Saints are keen to extend his contract beyond the current campaign. Tuala would love to stay on at Franklin’s Gardens and he says he is extremely thankful for the opportunity given to him. “I came here with the goal to become a professional rugby player and secure a spot in this team,” said the 25-year-old after being named man of the match in Saturday’s 46-0 win against London Welsh. “I’m working really hard on and off the field. “I’ve shredded down a bit. I had to do a bit of work once I got here because I was enjoying my family holiday before I came. “I’ve just been working hard on my fitness, trying to get some match fitness.